Providing Data to Educators to Support Increased Teaching of the Concept of “Carrying Capacity” in Core Curriculum. Are long lives of south temperate songbirds explained by reduced energy expenditure of parents compared with north temperate species? 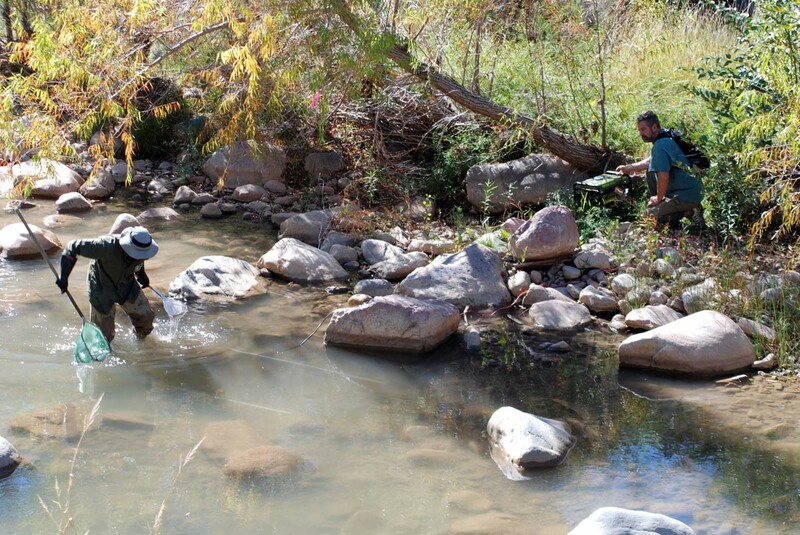 USGS: Assessing the food web structure and ecological function relative to the historical condition of the Rio Grande in the Big Bend region: Can we identify promising opportunities for native fish maintenance and recovery in a future water world? DWR: Weatehr & primary productivity Mediated Effects on Mule-Deer..
Habitat suitability modeling and island-wide rapid assessment for presence of the endangered Broad-Winged Hawk Buteo platypterus brunnescens and Sharp-shinned Hawk Accipiter striatus vennator in Puerto Rico. Contrasting the thermal ecology of the native Coldwater Crayfish and the native Ringed Crayfish: do these species have similar thermal tolerances and preferences? Assessment of trophic cascades for the Mexican wolf. Response of desert bighorn sheep in the Mojave National Preserve to respiratory disease. RWO94 Assessing occupancy and reproductive status of golden eagles at historic aeries in Texas. Asian Tapeworm in an Endangered Southwestern Fish: Assessing Infections Using a Non-lethal Molecular Screening Tool. Advancing Use and Application of Diverse Data Sources and Species Distribution Models. Can plasticity protect populations from rapid environmental fluctuation? Temperature, phenology, and embryo survival in Western Alaska sockeye salmon populations: the potential for adaptation to a warming world? Identification of summer habitat of the federally endangered Indiana bat (Myotis sodalis) and three other bat species of special concern within the Ozark - Central Recovery Unit; with application for landscape distribution use. The spatial distribution and impacts of endocrine disrupting compounds in the South Platte River basin, CO.
American eel age and growth assessment in the Roanoke River, North Carolina. A study of diamond darter macrohabitat use and abundance within the lower Elk River. Long-term research and monitoring of human dimensions information on fisheries and wildlife management issues in Minnesota. Range-wide habitat models for predicting habitat suitability of marsh birds throughout the U.S.
Assessment of drought impacts on selected fish and wildlife species in the southwestern U.S.
Assessment of Available Missouri Ecological Flow Data. Development of standardized and validated methods for sampling freshwater mussels in Missouri: Evaluation of factors influencing capture probability, occupancy estimation, and community and population metrics using visual survey approaches. Do river-reservoir interface habitats to serve as surrogate nursery habitats for floodplain-dependent riverine fishes? Survival rates and causes of mortality for black-tailed deer and mule deer in Oregon. Demography and seasonal movement patterns of band-tailed pigeons in New Mexico. Investigating impacts of energy development on lesser prairie-chicken reproduction, survival, movement, and habitat use in eastern New Mexico. Climate change effects along a latitudinal gradient in the Pacific Northwest. Assessment of vegetation succession and spatial dynamics in Okefenokee Swamp, GA.
Sicklefin Redhorse Ontogeny, Recruitment, and Priority Habitats in Regulated Rivers. Movements, Site Fidelity, Foraging Ecology, and Roosting Behavior of Ring-billed Gulls in Relation to a Water Supply Reservoir in Central Massachusetts. Activities and behavior of participants and geese during the Light Goose Conservation Action in the Rainwater Basin of Nebraska. Tributary habitat use of endangered and imperiled fishes in the Price River, Utah. Factors affecting distribution and abundance of the endangered yellowcheek darter. A comprehensive examination of endocrine disrupting compounds and intersex fish in North Carolina water bodies. Ecology of non-breeding waterfowl in the Wabash River region. Modeling suitable habitat for the robust redhorse in the Pee Dee River. Expanding the range and scope of the Designing Sustainable Landscapes to the entire South Atlantic Landscape Conservation Cooperative area. Manatee protection areas in Puerto Rico. Integrated Waterbird Management and Monitoring within the Atlantic and Mississippi Flyways. Assessing extent of gene flow and phylogeographic patterns among imperiled coldwater crayfish (Orconectes eupunctus) populations in the Black River drainage of Missouri. Invasive bighead and silver carps and the Great Lakes: evaluation of alternative natural food sources for the invading carp. An evaluation of a large-scale restoration effort for Bonneville cutthroat trout in Righthand Fork following non-native brown trout removal: towards a better understanding of restoration options for imperiled native fishes. The Imperiled Coldwater Crayfish (Orconectes eupunctus) in the Black River Drainage of Missouri and Arkansas: Distribution, Population Genetics and Factors Affecting Distribution and Decline. Evaluating fish growth and production potential across Ute Reservation reservoirs. The effects of extirpation and reintroduction on the Mexican Wolf (Canis lupus baileyi) through genome-wide association. Survey of the freshwater mollusk assemblages in the Little River, Virginia. Sustainable communities and landscape designs. Evaluating the influence of climate and predation on the survival of Rocky Mountain Elk: A regional synthesis across northwestern states. Has CWD produced genetic selection in the Wisconsin white-tailed deer populations? Response of Greater Sage Grouse to Habitat Treatments in Wyoming. Feasiblity Assessment for Translocation of Imperiled Bull Trout Populations in Glacier National Park. Modeling effects on Brook trout (Salvelinus fontinalis) distribution in the Delaware Water Gap National Recreation Area. The Critical Leading Edge of Gulf of Maine Salt Marshes – Interface with Freshwater Wetlands, Uplands, and Constraints by Human Development. Collaboration with Joe Kelley, Dan Belknap, Margot Mansfield, University of Maine. Lake Trout Suppression in Yellowstone Lake: Developing Benchmarks for Harvest and Sampling Design to Measure Efficacy. Development and Dissemination of High-Resolution National Climate Change Dataset. Adaptive management framework for Nebraska Natural Legacy Plan. Modeling the response of imperiled freshwater mussels to anthropogenically induced changes in water temperature, habitat, and flow in streams of the southeastern and central United States. Threat specific escape behaviors and habitat use by northern bobwhite. Can camouflage keep up with climate change? Connecting down-scaled climate models to adaptation for a key forest species. Southeast integrated assessment: Climate change and wildlife dynamics. Phylogeographic and genetic patterns of thermal tolerance: predicting Ozark crayfish population invasiveness, stability, or endangerment. Spatial Analysis of Relations among Conservation Practices, Aquatic Ecosystem Services, and Human Well-being in the Albemarle-Pamlico Basin. Habitat Suitability for Roanoke Logperch in Streams near Philpott Reservoir. Biological Monitoring and Geomorphological Characterization for the USGS Eastern Region Initiative on the Clinch (ERIC). Implementation of amphibian monitoring and adaptive management for wetland restoration evaluation. Impacts of the pine beetle epidemic on lodgepole wildlife SGCN in Wyoming. Development and Validation of Models to Assess the Threat to Freshwater Fishes from Environmental Change and Invasive Species. Population Assessments and Propagation of Federally Listed Species to Address Recovery Criteria in the Powell River, Tennessee and Virginia. Effects of climate change on barrier island habitat and nesting sea turtles. Spatial and temporal variation in the structure of stream food webs: investigating the effects of shifting basal resources and predation from a top predator, the river otter. Movement Patterns and Habitat Use of Migratory Canada Geese Wintering In and Adjacent to the Santee National Wildlife Refuge Phase #2. Winter ecology and habitat use of lesser prairie-chickens in west Texas. Does thermal tolerance of fish vary by life stage? Influence of energy development on mule deer migrations. Small Mammal Distribution - Sagebrush habitats - SW Wyoming. Implications of Climate variability for optimal monitoring and adaptive management in wetland systems. Living Green: Living with sea turtles. Is Lack of Adequate Food a Bottleneck to Survival of Devils Hole Pupfish Larvae? Dissolved Oxygen Requirements for Freshwater Mussels Phase 1: Development of Test Systems and Experimental Protocols. Distribution, abundance, and movement of native cutthroat trout in the Snake River below Jackson Lake. Spectral and response assessment of wildlife-friendly lighting. Designing sustainable landscapes for bird populations in the eastern United States. Striped bass movements in the Penobscot River Maine. Fishery population and habitat assessment in Puerto Rico streams. Interaction of stocked trout with native nongame stream fishes. Home range and habitat use of red-shouldered hawks. Avian productivity and survivorship on the Welder Wildlife Refuge. Lesser Prairie-chcken ecology during pre- and post-construction of wind energy facilities in west Texas. Survival, habitat use, and movements of female dabbling ducks during winter. Reproductive ecology and habitat relations of the robust redhorse in the Pee Dee River. Stream trout ecology and management in North Carolina State Parks. Assessment of beach compaction and associated effects on loggerhead sea turtles nesting on natural and nourished beaches in northwest Florida. Assessment of coastal habitats and listed species. St. Joseph Peninsula beach restoration project. Assessing the effects of coastline alteration on sea turtle nesting and faunal assemblages at Cape San Blas, Florida. Effect of the Introduced Crayfish, Orconectes neglectus, on Native Crayfish in the Spring River Drainage. The relationship between forage base and trout production in catch and release areas on Bull Shoals and Norfork tailwaters. Effect of catch and release areas on movement and mortality of resident rainbow trout in Bull Shoals and Norfork tailwaters. Factors affecting migration and recruitment in headwater fish assemblages of Buffalo National River.